Lest you’ve forgotten over the hectic festive period, here’s a reminder that there is a Badminton Session every Sunday night in the Hall – 6pm till 7.30. It is open to all ages, but costs £1 for adults and 50p for youngsters. For more information, see Caroline McGregor or Jean Casey, or contact us here. There is also a full sized table tennis table in the Hall, which can be used by villagers at any time. Details are here. Happy whiff-whaffery! This entry was posted in Badminton, Table Tennis on January 16, 2014 by KM. This entry was posted in Badminton on November 2, 2013 by KM. 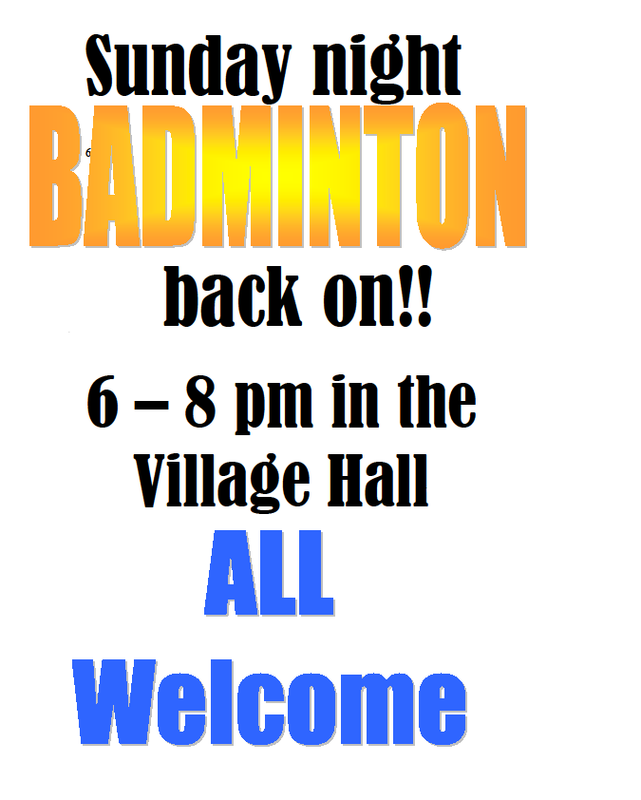 Badminton club is starting up again in the Hall this Sunday, from 6pm till 7.30pm. It’s open to all ages, and abilities. And costs £1 for adults, and 50p for youngsters, with juice and biscuits available. For more information, contact Caroline McGregor or Jean Casey, or contact us here. This entry was posted in Badminton on November 14, 2012 by KM.